Abby’s House (Abby Kelley Foster House, Inc.) was founded in Worcester, MA in 1976. A nonprofit organization, we provide shelter and affordable housing, as well as advocacy and support services, to homeless, battered, and low-income women, with or without children. Over the years, we have helped more than 13,000 women and their children reclaim and rebuild their lives, empowering them to lead self-directed lives filled with dignity and hope. Abby’s house is a safe and welcoming place that values people of diverse backgrounds and experiences. We provide a home to residents and guests, not just a place to live. We intentionally seek to create an inclusive community that celebrates all cultures. The Abby’s House Community commits to affirm women of all races, ethnicities, ages, national origins, sexual orientations, disabilities, educational backgrounds and gender identities. We embrace diversity and foster healing and well-being for all. We believe that each person is unique and deserves to be treated with dignity and compassion. We develop caring, supportive, non-judgmental, and enduring relationships. We listen to and give each other support, and we act on our belief that each one of us is capable and strong. We believe that women can name and change the injustice that exists in the lives of women. We encourage women to be leaders and decision-makers. Abby’s House helps women to recognize their own inner strengths, opportunities and abilities to lead self-directed lives. Abby’s House is a multi-cultural, multi-racial community of people working collectively to achieve our mission. Our community is comprised of residents, guests, staff, volunteers, board members, donors and partners. The contribution of each person is valued and respected and makes Abby’s House a special place that nurtures self-determination, independence and strength. 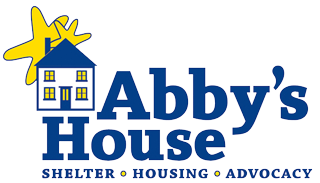 At Abby’s House, we lead the way in helping women and children find a place to call home. With 9 shelter beds and 77 units of housing, we are the largest provider of affordable housing in Worcester designed to meet the needs of women and children. But we couldn’t do it without you: our supporters, volunteers, and donors. Because of your support, we don’t have to accept government funding for our programs, allowing us to serve women from all circumstances and helping each woman who comes through our doors meet her individual goals. Thanks to you, we have kept the doors open for women and children in need in our community, ensuring they have a place to call home and the support they need to regroup and get back on their feet. We appreciate the efforts of everyone who’s involved in helping us fulfill our mission.